In my strategy games, there are limits to how and where you can move a piece. Most games allow only select movements but the board is stagnant. When you have to predict plans from all angles, you have to have good Oversight. 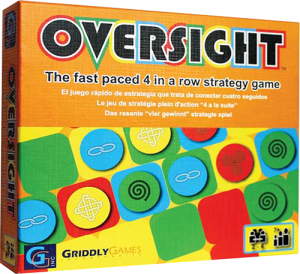 The game Oversight challenges players to see the board from all angles. Players can move both vertically, horizontally and can move the board itself to achieve a connection. 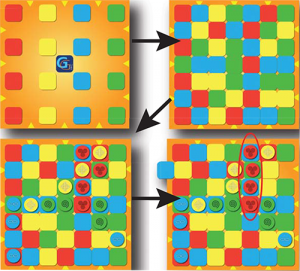 When a player moves, he can choose to put a piece on the board or move a row or column over a space. The goal is to get four playing pieces to line up in a row, either horizontally, vertically or diagonally.Thinking and planning is key. Do you try to line up your playing pieces or do you block your opponent. Is moving the game board to your advantage? Seeing all the options is important to winning. The biggest problem that I have with many strategy games that involve color matching is that the game is difficult, if not impossible, for players for a color challenged (color-blind). What makes Oversight a great game for everyone is that one side of the color disk has an image. Instead of totally relying on color, you can match images on the back of the disk. Now my husband, who is color blind, can join in the family game. Oversight is a Griddly Games creation. It is available for purchase online or at select retailers. It sell for approximately $24.99 at Amazon.com and Are you a game.com. If you want to help your kids strategy playing, consider buying Oversight this holiday season. Disclosure: I received this game to review. All opinions are my own. Games like this really help kids think - my nephews would love this! Sounds like a fun game. I bet my son would enjoy it. Sounds like a fun game. I think my nephew would enjoy it. This looks like a fun game! We love games here so this would be great for our collection.